Once upon a time, bathrooms were decorated and equipped as a pure functional space. How times have changed, because these days the bathroom is one of the core focal points of any house (how many first-time guests excuse themselves to use somebody’s bathroom, only so they can take a sneak peek at the decor and accessories?). Just like bedrooms, bathrooms have become a prime space to reflect one’s personality, interest, and individual style. And there’s an entire list of costly procedures to enhance one’s bathroom to ensure it’s the best on the block. On the other hand, there are also a lot of inexpensive and quick ways to turn a bathroom around, and make it into a stylish and memorable space. Presenting to you today: some quick and easy ways to improve your bathroom in an afternoon. •	Faux wooden blinds. Don’t forego that elegant look of wooden blinds just because your bathroom tends to get wet. Faux wooden blinds look just like the real thing, but won’t warp or lose their colour because of moisture and humidity. In addition, they’re also easy to clean and quite durable. •	Aluminium mini blinds. This option doesn't just come in white any more! A wide array of colours can be chosen from to blend in (or stand out) with your bathroom colour tones. Because the colour is baked onto the aluminium, they won’t fade. The aluminium blinds are also moisture-and water resistant, meaning that your window treatment will continue to look as great as they did on their first day. •	Top-down / bottom-up blinds. This option allows you to adjust the position of your blinds at the top and/or the bottom as you need to. Top-down / bottom-up blinds are also available in a light filtering option, allowing warm natural light to filter through when the window is covered, yet keeping your privacy intact. The shower curtain: once synonymous with cramped apartments, but now a fashionable and attractive decor piece. Replacing your old and worn shower curtain is one of the fastest ways to spruce up a bathroom, as it is one of the prominent eye-catching elements, especially if your bathroom is rather small. Shower curtains are versatile, can change with your decor, and require the minimum amount of space to hang loud and proud. Depending on your decor, a ruffled fabric can nicely enhance your romantic bathroom setting. Or else, opt for a high-contrast colour to offset stylishly with your sleek and modern bathroom fixtures. What’s more, shower curtains can be pulled back to add visual space to your bathroom, or drawn shut to project the focus on the colour/texture instead. homify hint: Hang your curtain rod near the ceiling for a more luxurious look – just make sure the curtain brushes the floor. Pressed for time to enhance your bathroom, and also for space? It is true that the bathroom never seems to have enough storage options. So many little odds and ends (toothbrushes, razors, shampoos and conditioners) can easily take over a bathroom, especially the smaller ones. What are some quick and inexpensive ways to squeeze a little extra storage out of the bathroom? •	Don’t have a bathroom cabinet? 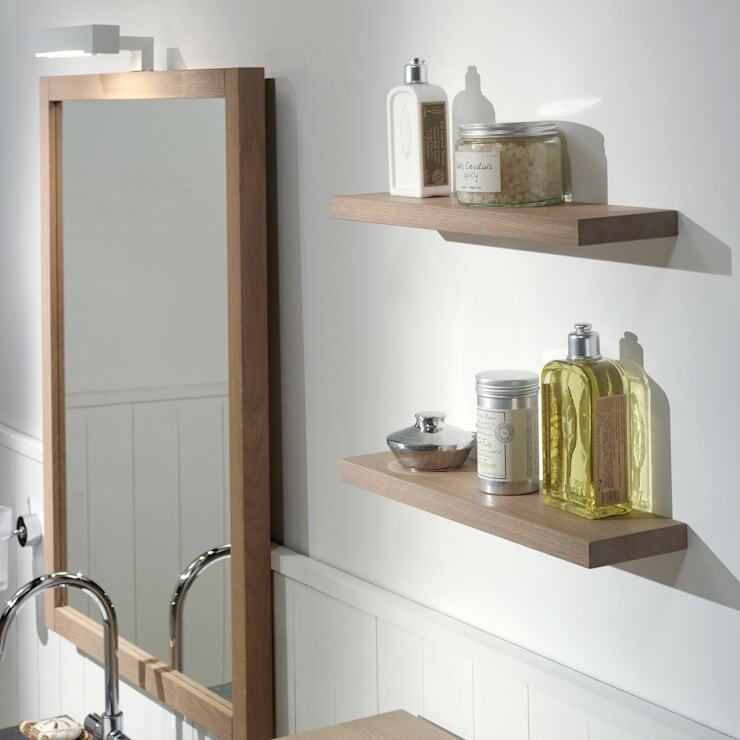 Opt for some floating shelves next to your mirror for those everyday items (like your toothbrush and moisturiser). •	Mount a shelf above the door for small items like toilet paper, extra towels, etc. •	No space for a towel rack? No problem – add a hook/horizontal railing on the back of your bathroom door. •	The space above your toilet is a great spot for an extra cabinet, shelves, or even a basket full of toiletries or magazines. •	Hang some creative spice racks on your wall to store (and organise) your makeup. Definitely one of the hardest working members in the household, let’s hear it for our bath towels! They’re expected to clean us, dry us, add a visual look to our bathrooms, and wipe off those unwanted smudges. 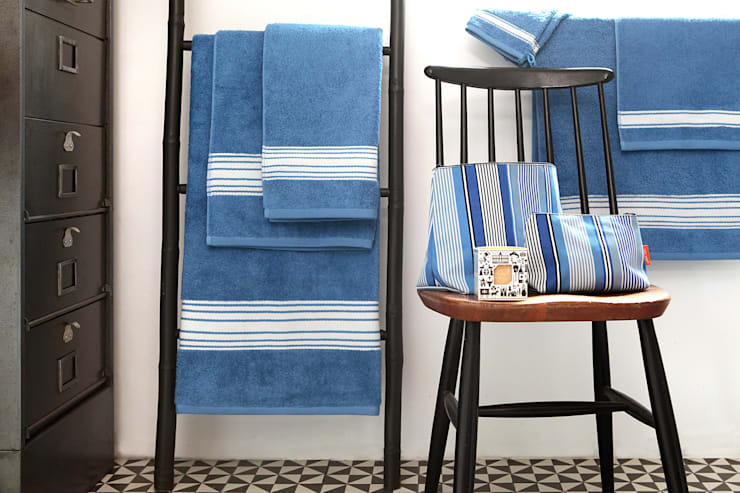 Towels are a simple and cost-effective way to enhance (or completely change) the look of a bathroom. Because of their range of available colours, textures and designs, they’re a great way to have fun with your decor. So, use them the way you would use other design accents (like, for example, the scatter cushions in your living room). A variety of bright, colourful towels placed in the bathroom can provide one tasteful touch, and give the room a focal point. But also remember: nothing beats the luxurious ambience of a bathroom stocked with fresh and fluffy white towels. It’s a classic look that never goes out of style. homify hint: Want to keep your towels softer for longer? Go easy on the tumble drying, as the heat can damage the integrity of the cotton. Use a lower setting or alternate between tumble drying and air drying. •	The style. 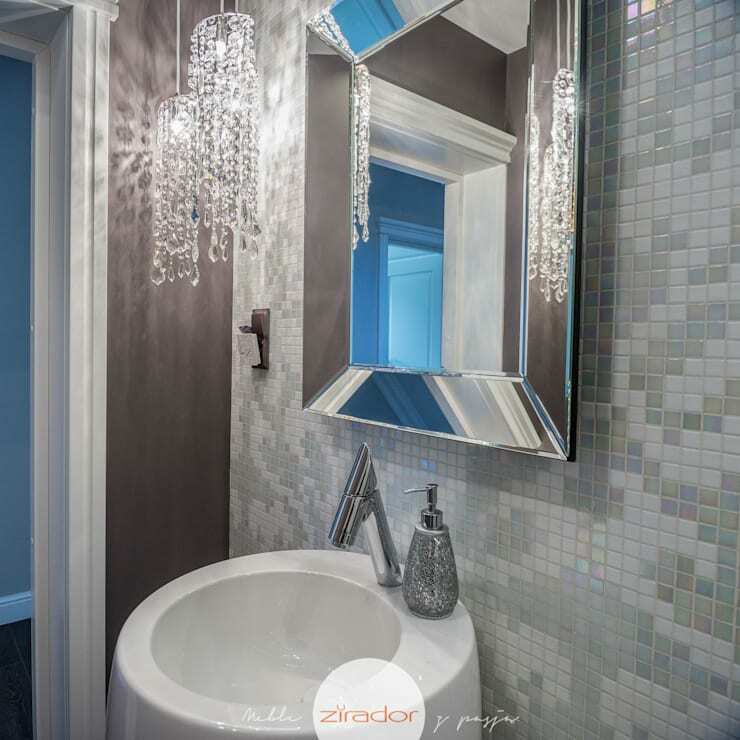 Your mirror must blend in with your bathroom style and not look like an afterthought. •	The size. Keep proportions in mind and measure your mirror space before hitting the stores. You don’t want to overwhelm (or underwhelm) your bathroom with a mirror that’s the wrong size. •	The shape. Rectangular or round? Perfectly squared or heart-shaped? Yes, it does matter! Make sure the mirror’s shape complements the rest of your bathroom décor / style. •	The frame. Whether stainless steel or embedded seashells, your mirror frame does have a part to play, and must blend in naturally into the rest of your bathroom. A multitude of possibilities exist, limited only by your imagination and budget! •	Place baskets under sinks for easy towel access. Neatly folded and packed together will give your bathroom a homey look, and prevent you from drilling holes into your walls for towel rings/railings. •	Create a neat towel display by using a free-standing hutch or bookcase in your bathroom. •	Add a coat rack for a sophisticated and convenient storage/display spot. As this is a mobile option, your towels will always be close by, whether you’re enjoying a shower or soaking in the tub. •	Mingle your towels in-between other decor pieces and accessories in a hutch. Depending on your chosen accessories, your towel storing possibilities are quite varied (such as rolling and placing them in a bowl). 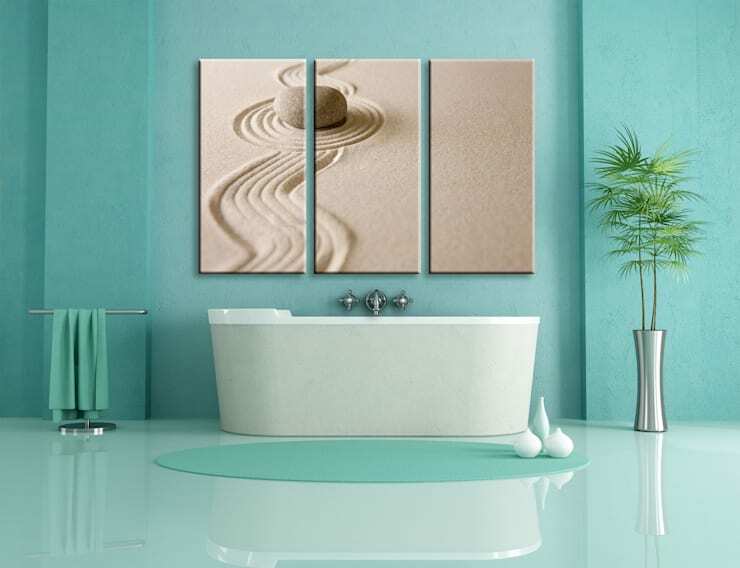 Change your bathroom’s mood quickly and easily with a new bath mat. Not only is it an extra addition of colour, but it also offers some warmth and comfort for wet feet. Consider the size of your bathroom and how many mats you want to add (i.e. just one next to the shower, or another one under the sink?). And what colour will you go for? A simple mat can easily blend in with the bath space and also link up with the decor elements. On the other hand, a multi-coloured mat can draw in more colours from the curtains, flooring, etc. 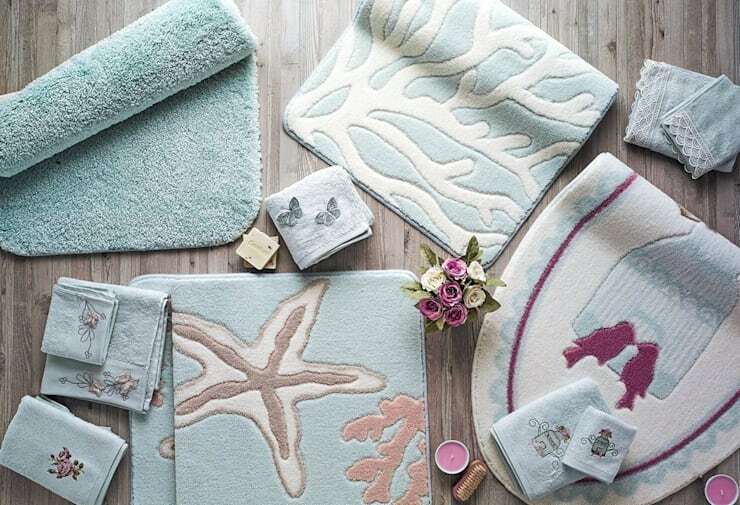 homify hint: Your bath mat needs to be pretty, yes, but it must also be safe. Consider bath mats made from cotton, as they absorb any moisture and are less likely to cause slippery surfaces. They should, however, be dried whenever wet. 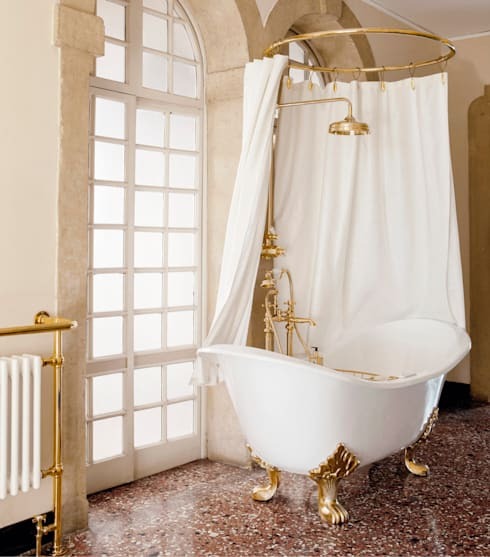 From floor beauty to wall aesthetics, take a look at the exquisite wall art that the Italian professionals at Bimago can accomplish for (among others) bathrooms. Indoor plants are an easy way to add a splash of fresh colour to any bathroom. They are natural and eco friendly decor pieces and also come with charming scents. The best bathroom plants require little light, as many bathrooms have small or no windows. However, while low light plants can survive on little light, they still need a beam here and there. Opt for LED lighting, as they’re not only plant-friendly, but will also lower your electricity bill. Also ensure that your chosen plants will thrive in a humid and moist environment. Ask your friendly neighbourhood florist (or Google) for advice on the best plants for a bathroom, and have fun searching for some fabulous new pots to display your new greeneries. From small, pocket-friendly ways to boost your bathroom to a more costly approach: redoing your bathroom floor. Have a look at Which Floor For Your Bathroom? for some homify advice. And there you have it – stunning simple steps to a new bathroom. What other ideas can you add to our list?